The thing that surprised me most when I first visited Minnesota more than 15 years ago was how many Somalians lived there. (Today there are more Somalians living in the Twin Cities than any other place in the United States.) So it’s no surprise that Hollywood went to Minneapolis when it was looking for Somalians to cast in the movie Captain Phillips. Barkhad Abdi was one of more than 700 people who showed up for an open audition in Minneapolis and I bet he was surprised when he walked away with the lead Somalian hijacker role (Muse) acting opposite two-time Oscar-winner Tom Hanks (Captain Phillips). And maybe even more suprised when he recieved a SAG nomination yesterday. Not a bad first acting gig. But good filmmaking is also about experienced, skilled people working together—and the Captain Phillips cast and crew had that in abundance. They were led by documentary trained director Paul Greengrass known for his work directing The Bourne Supremacy, The Bourne Ultimatum, and United 93 (for which he received an Oscar nomination). And there was screenwriter Billy Ray (The Hunger Games) to bring his more than 20 years of experience writing the script based on the book A Captain’s Duty by Richard Phillips and Stephan Talty. P.S. Can anybody recommend a Solmalian-made film that can give those outside Africa a different view of the country and its people? I did find a Wikipedia link to the Cinema of Somalia—but I’d love to learn about screenwriting from Somalia and the country’s filmmakers. Don’t Bore the Audience! Can Tennesee Williams and UCLA’s Richard Walter both be wrong? Today is the 30th anniversary of the “Miracle on Ice.” I remember the day well. And as big as yesterday’s Team USA’s victory was over Canada, it was a blip on the radar compared to the 1980 victory over the USSR. Even if you weren’t born yet you are probably familiar with the event that happened on February 22, 1980 when the US hockey team defeated the USSR. What made the victory so remarkable was we hadn’t defeated the USSR in 20 years. And for all of that time this country was in a Cold War and it was clear that the USSR was our enemy. High drama. At that time there were two super powers in the world who both had loads of nuclear arms. Threat of a nuclear war was always at hand. This provided a lot of tension and some great material for Tom Clancey’s novels and quite a few Hollywood films. And, of course, it set the stage for the events that would unfold in the famous game. I was a high school senior in Florida at the time and had never even seen snow much less been to a hockey game. But 30 year ago the Winter Olympics were special in a different way. It was a world before cable TV and the Internet. So when the Winter Olympics were on one of three available stations every four years—it was a big deal. (And in a time before glossy, sentimental TV vignette stories, it was us against them. USA verses whoever, as opposed to pulling for the athlete with the most compelling life story.) I didn’t actually watch the game, but I remember being at work and hearing the news and the celebrations that followed. What also made the USA hockey team’s victory over the USSR so sweet was the USSR did not have pro hockey so the best players in their country of any age and experience were playing against college age guys from the USA. It was a mismatch. The USSR had won Gold in Hockey in all but one Olympic games since 1956. In an exhibition game against Russia just a few weeks before the Olympic games Team USA lost 10-3. According to Wikipedia, the USA Olympic coach that year was Herb Brooks who was born in St. Paul, Minnesota and in high school played on the team that won the state hockey championship. He went on to play at University of Minnesota, despite being cut by the 1960 Olympic team he played on the ’64 & ’68 Olympic squads. He then turned to coaching at the University of Minnesota where he won the NCAA championship in 1974, 1976, and 1979. Four of the players were also from Boston University including the US captain Mike Eruzione. Eruzione would be the player who scored the game winning goal in the famous game. A couple years ago I received a call to video tape Eruzione who was speaking in Iowa to a youth hockey organization. Just before the shoot I remembered one of the few Sports Illustrated covers I kept over the years was the March 3, 1980 issue with the famous cover shot by photographer Heinze Kluetmeier of the victory celebration. 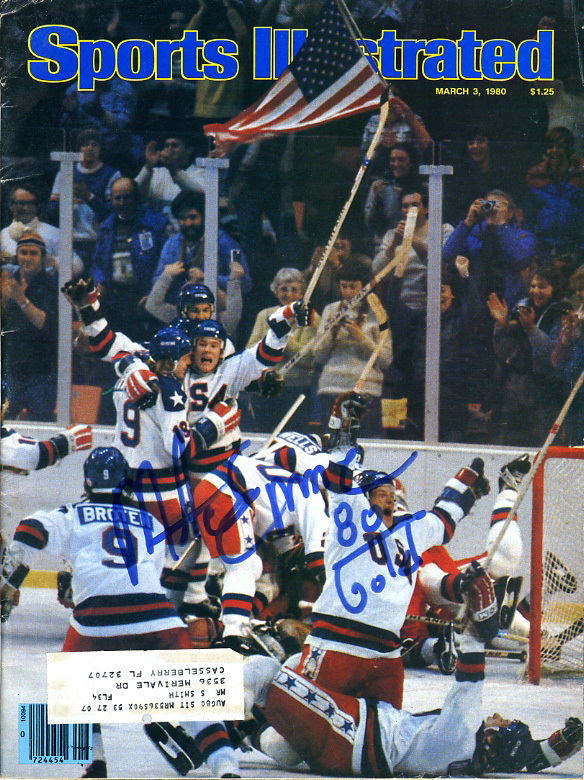 I took the magazine with me to the shoot and Eruzione was gracious enough to sign it. I remember that victory well. It was good day. Good enough to result in a 1981 TV movie, a documentary that aired on HBO, as well as the 2004 Disney film Miracle starring Kurt Russell as Herb Brooks. Miracle was written by Eric Guggenheim. Here is part of a Q&A that Debra Eckerling had with Guggenheim for Storylink. Q. (Eckerling) Why did you write Miracle? A. (Guggenheim):I’m drawn to stories about redemption and second chances. For me Miracle was always less about hockey and more about those themes. Of course I also responded to the fact that this was the ultimate David versus Goliath story. But the biggest draw was the coach, Herb Brooks. In Brooks you had the makings of a terrific character. He wasn’t very likeable, but what’s interesting is that he made a conscious choice to be that way in order to bond his team together. And even if that wasn’t apparent, his backstory made him incredibly sympathetic. Also, the notion that a hockey team could lift the spirits of an entire nation was very intriguing to me. Last night I finished the last episode of season five of LOST, so now I’m ready for the final season which starts next week. And for whatever reason the TV show Northern Exposure crossed my mind. Probably because that’s one of my top five TV programs of all time. Loved the small town and the interesting characters. Loved the writing. I’ve always said I wanted to live in the fictitious town Cicely Alaska and I imagine it played into my psyche when I moved to Iowa almost seven years ago. (Though in real life my experience has been that if you want to visit a real life Cicely-like place try Ely, Minnesota or Talkeentna, Alaska.) But I find there are traces of Cicely, Alaska everywhere. 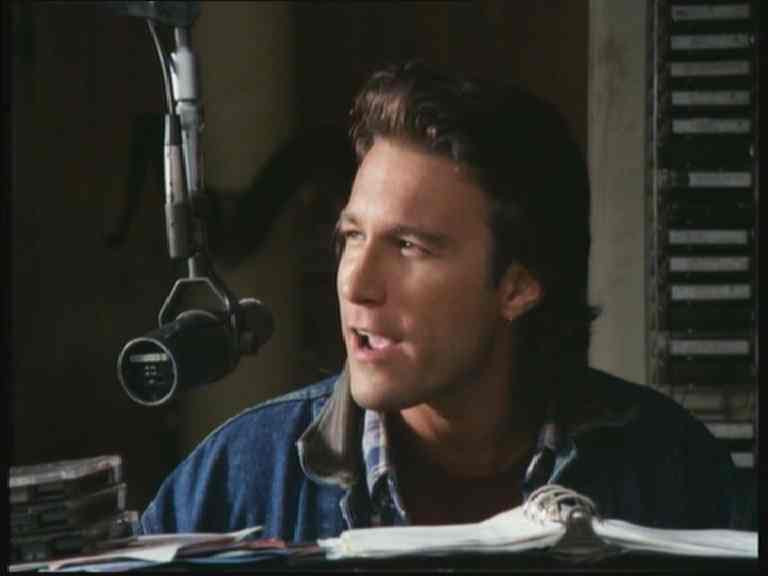 It’s hard to believe that Northern Exposure started airing 20 years ago. Can 1990 really be 20 years ago? It was a simpler time before people were blogging, text messaging while driving, nor was there even the Internet as we know it. A time when part of the nation leaned on a DJ at KBHR for a little prime time philosophy. Even if you didn’t agree with all his philosophy, you had to appreciate the words and the thought process (as well as John Corbett’s voice). Goethe’s final words: “More light.” Ever since we crawled out of that primordial slime, that’s been our unifying cry: “More light.” Sunlight. Torchlight. Candelight. Neon. Incandescent. Lights that banish the darkness from our caves, to illuminate our roads, the insides of our refrigerators. Big floods for the night games at Soldier’s field. Little tiny flashlight for those books we read under the covers when we’re supposed to be asleep. Light is more than watts and footcandles. Light is metaphor. Thy word is a lamp unto my feet. “Rage, rage against the dying of the light.” “Lead, Kindly Light, amid the encircling gloom, Lead Thou me on!” “The night is dark, and I am far from home.” “Lead Thou me on! Arise, shine, for thy light has come.” Light is knowledge. Light is life. Light is light. But I was surprised how little connection there was between the two story-wise. I remember reading the book Seabiscuit after seeing the movie and it was remarkable how similar the two were. In that case several hundred pages had to be pared down, meaning that huge chunks the story had to be left out. In other case things were added to streamline the story. But the two worked as almost a mirror of each other. Not so with Up in the Air. The core is there. A man named Ryan Bingham flies around the country living in hotel rooms and chalking up frequent flyer miles in between his job as a career transition consultant—he fires people. Yet though he is connected to the entire United States, he’s disconnected from just about everything and everyone else. And he does motivational speaking on the side. Though in the movie it’s a seminar called “What’s in Your Backpack?” and in the book it’s a business parable called The Garage. They are similar, yet different. In the book Bingham is 35-years-old (which explains why Leonardo DiCaprio was attached at one time), Clooney is closer to 50. In the book Bingham’s base is Denver and in the movie it’s Omaha. (Perhaps because Omaha represents more the middle of the country. Perhaps as a tribute to writer/director Alexander Payne (Sidesways, Election) who Up in the Air director Jason Reitman is said to be a fan of his work. The plot of the book is more about Bingham getting a million frequent flyer miles where in the movie it’s more about Bingham keeping his way of life on the road alive. The story and supporting characters are probably the biggest differences between the book and the film. Perhaps the biggest additions to the movie that are not in the book are Bingham has a young female traveling companion and there is an online technological change to the film. Both of these help the film. One gives Bingham a chance to explain his way of life and the other help make the story contemporary. Both stories have a good twist in them, but the twists are different. But the theme of people losing their jobs is much more timely in 2009/2010 than it was when the book was first released. Update: You can follow Walter Kirn on Twitter @walterkirn.